A Russian passenger jet carrying 124 people caught fire as it taxied down a snowy runway and then exploded at a Siberian airport on Saturday, killing three people and injuring 43, including six who were badly burned, officials said. Most of the passengers and crew were evacuated before the explosion, though one person described a chaotic scene as panicked people rushed through flames to escape the burning plane. Emergency services spokesman Vadim Grebennikov said the fire, which began in one of the engines as the plane taxied for takeoff, caused a powerful blast that destroyed the Tu-154 aircraft and spread flames across 11,000 square feet. 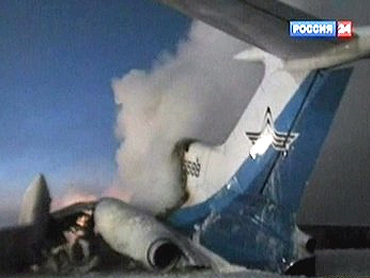 Russian television showed video taken with a mobile telephone of the burning plane, its center a giant fireball. All that remained afterward was the tail section and part of a wing. Itar-Tass news agency quotes a member of the Russia pop group Na-Na (who were on board) describing the panic among passengers when the plane caught fire. Singer Sergei Grigoriyev said people were "literally stepping on each other's heads" in an effort to escape. "I saw my life flash before me," he said. Fellow band member Vladimir Politov said there was trouble opening the emergency exits. "People began to really panic, with some of them running right through the flames," Politov said. The plane, which belonged to the regional Kogalymavia airline, was flying from the western Siberian town of Surgut to Moscow. Among the passengers were members of the Russian pop group Na-Na, who described the panic on board the plane. "When the engines were started up, something went wrong and the outer covering of the plane caught fire," group member Vladimir Politov said by telephone, the RIA Novosti news agency reported. "We had trouble opening the emergency exits and people began to really panic, with some of them running right through the flames." Politov said he and the other members of the group, which was popular in Russia in the 1990s, got out through an emergency exit over a wing and none of them was hurt. The Tu-154 has been the workhorse of the Soviet and post-Soviet civilian aviation industry, first entering service in the 1970s. But after a series of crashes involving the aging fleet raised safety concerns, flagship carrier Aeroflot withdrew all of its Tu-154s from service, with the last flight a year ago. The midrange jet remains, however, the mainstay of smaller airlines across Russia and the former Soviet Union. It is banned from parts of Europe due to excessive engine noise. Just last month, two people were killed and 83 injured in an accident involving engine failure on a Tu-154. Two of the engines failed shortly after takeoff from a Moscow airport and the third cut out as the plane made an emergency landing. It skidded off the snowy runway and broke apart.